Contact us by phone at 863-692-0906 (Eastern Time Zone) or by e-mail at birdsasart@att.net . The att e-mail address is best from overseas. We gladly accept credit card orders by phone 8am till 7pm Eastern Time (8 am till 3pm Fridays). You can use the PayPal links on the web site to order anything. Just type in the item(s) and the amount. If using your own PayPal account, please send to either of the e-mail addresses above. Photographic theme: Images created just before, during and just after the SW FLA Spring IPT. Canon 500mm f/4L IS lens (on Mongoose with 4th GD low foot), 1.4X II TC, and the EOS-1D MIII. ISO 400. Evaluative metering + 2 2/3 stop off sky set manually: 1/500 sec. at f5/6. I scouted the Venice Rookery the day before the IPT started. 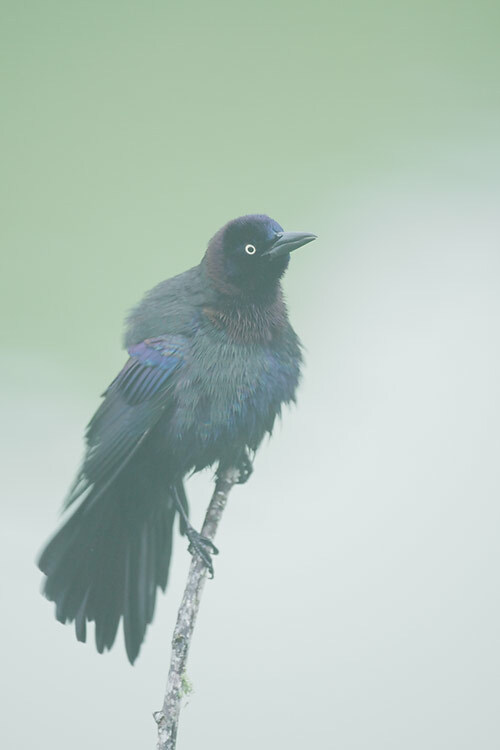 It was a foggy morning so I was glad to come away with one family jewel. I used the central sensor and the MIII focused perfectly; I cropped a bit off of the bottom. There were very few breeding pairs of Great Egrets present. Todd lost his Dad, Paul Gustafson, just last week. I only met Paul once. He was a large gentle man who was always smiling. He had an interest in photography and was very proud of his talented son’s many accomplishments (which include being a great son, husband, Dad, world class professional trumpet player, world class finish-carpenter, and world class professional photographer but are otherwise too numerous to list here). Todd's great love of East Africa was born when he was (to missionary parents) in Tanzania more than four decades ago. Todd is in Belize right now so all of the following may not be completely accurate, but my understanding is that Todd's Dad founded a school in the Usambara Mountains about 40 years ago. The school was recently being named as a university and Todd's Dad was to travel there in February to be honoured at the ceremony. Todd had planned to accompany his Dad. Todd got home from Tanzania on a weekend and was supposed to head back to Africa with his Dad midweek. He called his brother on the way home from the airport to learn that his Mom and Dad had been in a head-on collision caused by another vehicle. Both suffered a variety of serious injuries. On that Monday the doctors told the family that Todd's Dad needed bypass surgery immediately and could not travel to Tanzania. On Tuesday they said "Never mind,” and gave Todd's Dad their blessings for the trip to Africa. Todd and Paul made the round trip successfully and Todd was overjoyed that his Dad got to witness the completion and celebration of his life's work. Paul had the surgery after getting back to the US and was doing quite well when he was felled in short order by a massive blood infection. While arranging the funeral ceremony, it was planned that the many male grandchildren would carry the coffin. Anders, Todd's young son--I think that he is 11--said to Todd, "When they list the pallbearers, they should spell it P-A-U-L, Paul-bearers. They did. Todd's Dad was laid to rest on Monday, March 26, 2008. I know that Todd is missing his Dad greatly. If you have met or travelled with Todd, I know that he would appreciate hearing from you via e-mail: Gustaphoto@aol.com. The SW FLA Spring IPT, the last of the large IPT groups, was a big success. On our first morning, Monday March 17, we visited the Venice Rookery and had a good but not great morning photo opps-wise, but a great morning learning wise. Starting at Venice gives us a chance to keep the group close together and to keep close tabs on everyone. I was assisted by Alfred and Fabs and crack BPN moderator Axel Hildebrandt. 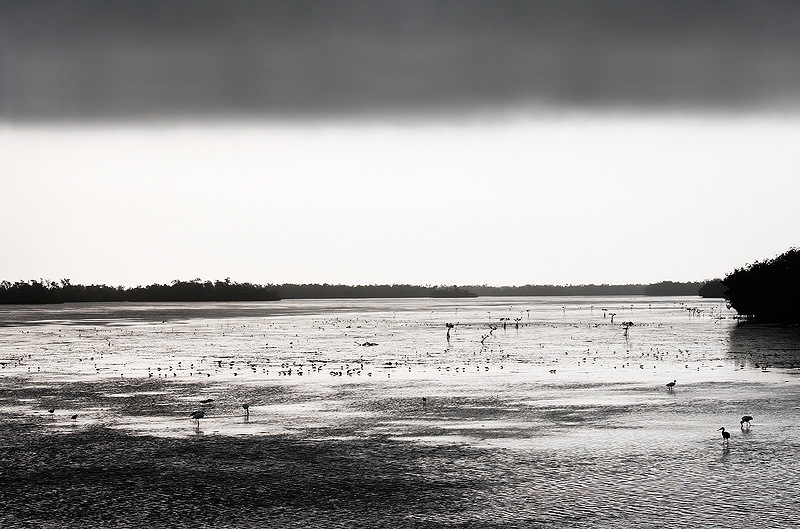 That afternoon we headed down to Placida and got some great flight photography practice with handheld short lenses and Brown Pelicans. On Day 2, we visited Ding Darling at dawn, but it was pretty much D-E-A-D so we continued on to Blind Pass which was not much better. We did enjoy a single tame Great Blue Heron at the edge of the surf. I then reached into my bag of tricks for my very best Sanibel back-up spot: we enjoyed more great flight photography with Brown Pelicans, got portraits of both breeding plumage and immature White Pelican, and made point-blank head portraits of Snowy and Great Egrets and Double-crested Cormorants. We started out image critiquing session that afternoon, made our way to Cape Coral for some great Burrowing Owl photography, and finished up with pizza and the rest of the image critiquing. Canon 600mm f/4L IS lens (on Wimberley head), 2X II TC, 25mm Extension Tube, and the EOS-1D MIII. ISO 400. Evaluative metering +1/3 stop: 1/400 sec. at f/10. Day 3 found us at the eastern end of Estero Lagoon well before sunrise. There was a brisk east wind. We encountered a small feeding spree with Great and Snowy Egrets and while working them, a very cooperative white-phase Reddish Egret flew in and joined the party. With the strong wind, some folks opted to work the Wilson's Plovers that were reluctant to fly. We headed west down the lagoon to my favorite feeding spot and broke out some thawing Greenbacks, large native baitfish. 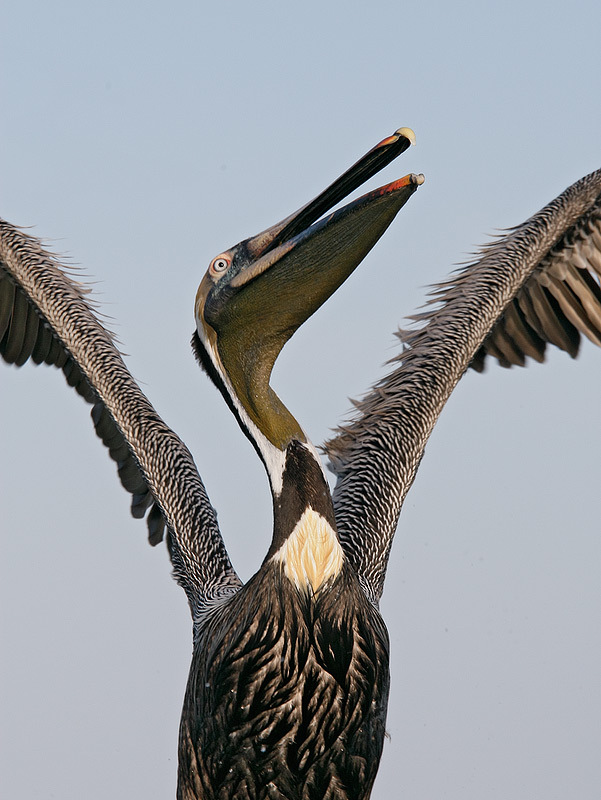 When we tossed the first fish we were amazed to see several pelicans leap high into the air to grab a fish. Most folks grabbed a short lens, sat in the shallow water, and had a ball. 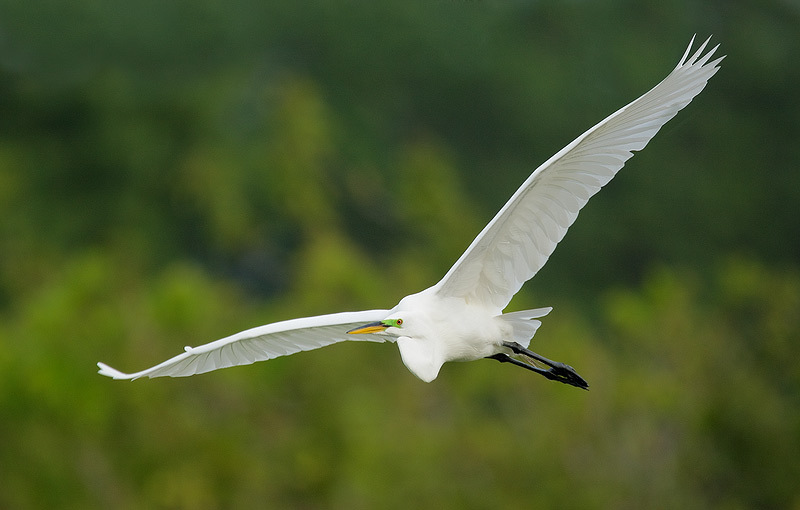 We also enjoyed more flight photo opps with the Great Egrets and a dark phase Reddish Egret. The former eagerly responded to our tossed fish while the latter fished on its own in its typical drunken sailor fashion. It clouded up a bit by mid-morning as a super high tide flooded vegetated flats that are usually dry. 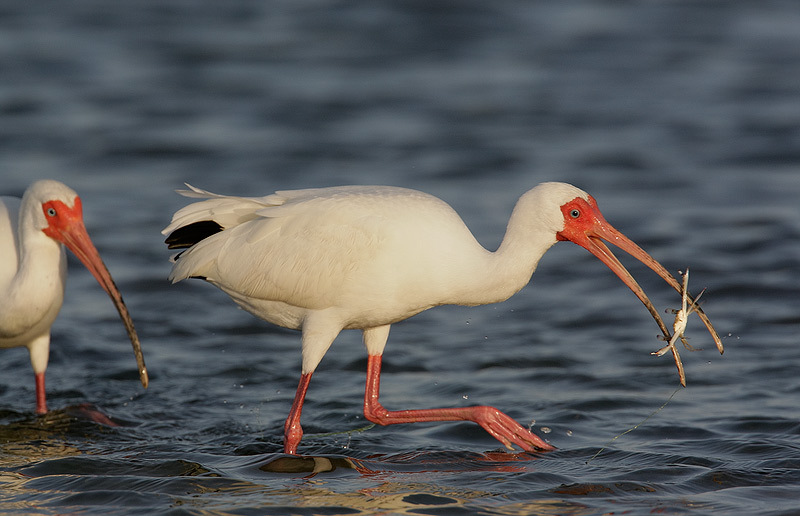 The White Ibis fed eagerly on the flats nabbing one fiddler crab after another. Canon 70-400mm f/4L IS lens with the 1.4X II TC (handheld at 208mm) with the EOS-1D MIII. ISO 400. Evaluative metering +1 1/3 stop off sky: 1/1250 sec. at f/8 set manually. 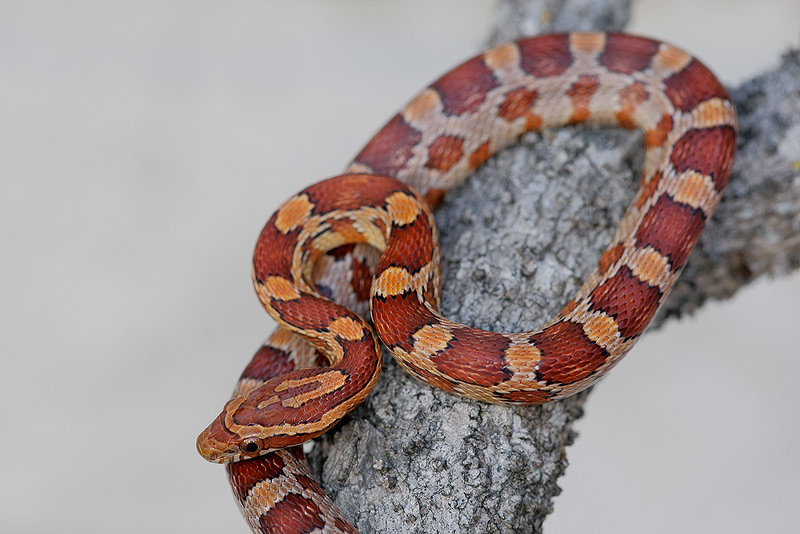 Linda Robbins, who had joined us that morning, had a captive baby Corn Snake with her. Her neighbor had wanted to kill the snake after capturing it in her house. During our long break, we posed the snake in a tree in front of the Holiday Inn. I set up my 180mm macro lens with the macro Twin Light and most of the groups took turns putting a flash card in my MIII and making images. After about twenty minutes of wriggling around the snake became totally relaxed, coiled up comfortably, and posed until we were completelly sated. Canon 180mm macro lens with macro twin light (at -1 with 1:4 ratio) with the EOS-1D MIII. ISO 400. Evaluative metering +1 stop: 1/100 sec. at f/5.6 on Mongoose M2.3. On the rare occasions that I do macro photography, it is uncanny that 9 times out of 10 my first compostion turns out to be my favortie. That was the case here. The wall behind the snake was stucco so I used wide apertures for the most part to avoid bringing up the unwanted BKGR detail. With clear skies and bright sun we did not head out to the lagoon until about 5pm. John Moran's (http://www.johnmoranphoto.com/index.html) good friend Ed Moynahan graciously agreed to tote my bucket and cast net out to the cut. 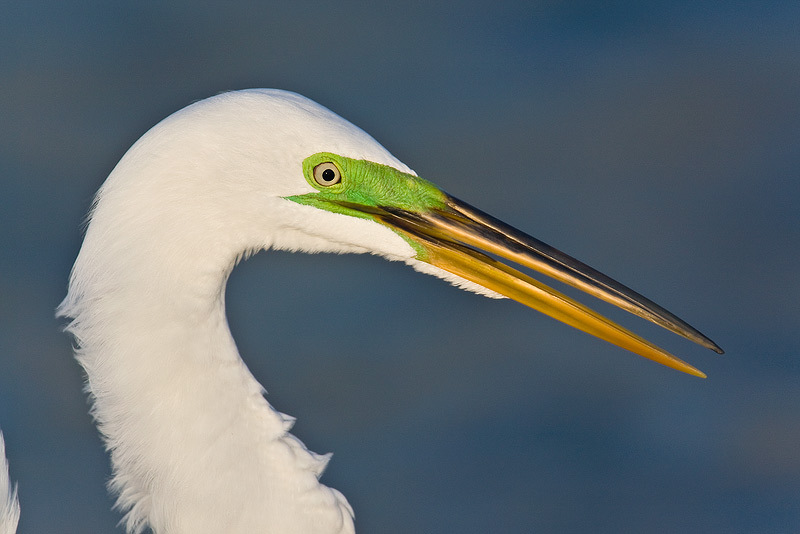 We stopped almost right off the bat for a lesson on photographing a brightly (almost blindingly) backlit Great Egret. There were several Snowy Egrets fishing in the inlet and several Ospreys flying overhead. I caught a variety of small baitfish with the cast net and the snowies gobbled them up (once they found them in a puddle that we created). Then I caught a mullet about 8 inches long. 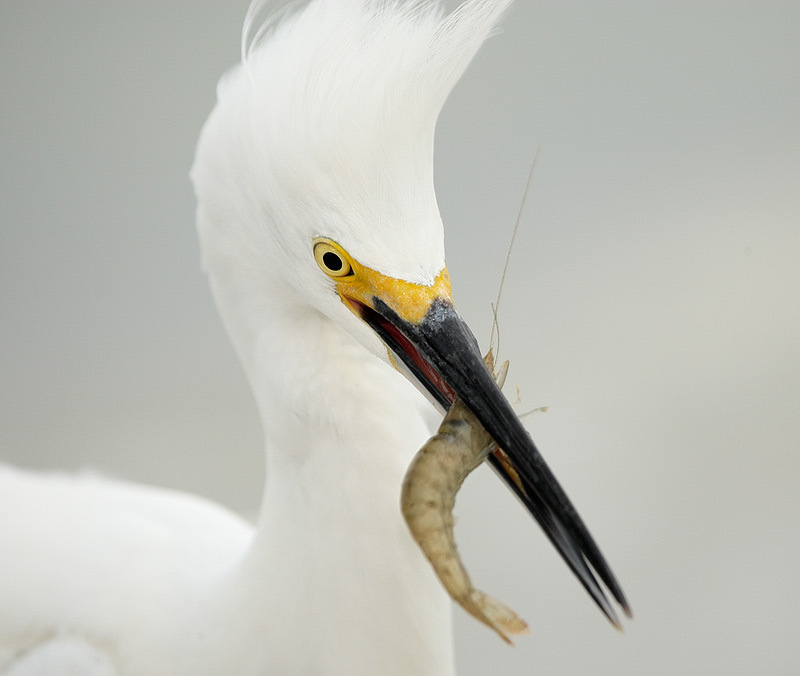 The snowies ignored it and suddenly, without warning, an absolutely gorgeous Great Egret with stunning Kelly-green lores flew in, snatched the mullet, turned away from us, and swallowed the large fish almost instantly. Bad luck. The bird, however, was eager for more and stayed put right in front of us for twenty minutes as the light got sweeter and sweeter. Good luck! Canon 500mm f/4L IS lens (on Mongoose with 4th GD low foot) with the 1.4X II TC and the EOS-1D MIII. ISO 400. (Are you seeing a pattern yet?) Evaluative metering +2/3 stop: 1/1000 sec. at f/5.6. I did lots of clean up on the bill as with the bird's head just about square to the imaging sensor there were lots of specular highlights... Had the head been turned slightly towards me, the great likelihood is that there would have been few or no specular highlights. On Day 4, the group opted to give Ding Darling a second chance. It was much better than on our first visit, but only shadow of what it used to be. We took advantage of some nice backlit situations and some dark clouds. 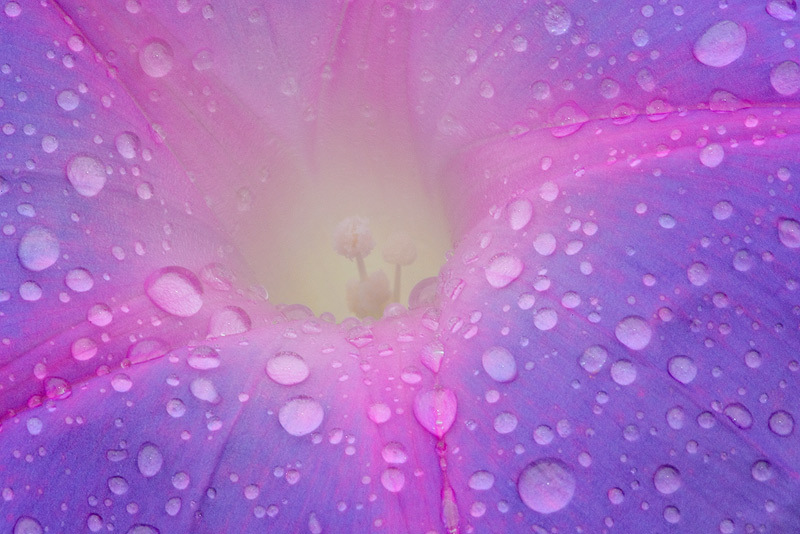 It drizzled off an on briefly, and this provided some nice raindrops on the morning glory blooms. We had some cormortants fighting over a fish, perched red-shoulder and Osprey, and some Yellow-Crowned Night Herons that were acting as if they would soon be nesting. We finished the morning off with a great lunch at the Hungry Heron on Palm Ridge. We headed back to the motel for a short nap followed by a long Photoshop session (taught by yours truly). Canon 180mm macro lens with macro twin light (at -2 with 1:4 ratio) with the EOS-1D MIII. ISO 800. Evaluative metering +1 stop: 1/4 sec. at f/32 on the Mongoose M2.3. I had been doing handheld abstracts of this very flower when we had a short sprinkle. That prompted me to go back to my Sequoia, grab the tripod, and painstakingly set up the tripod while attempted to step only on the limestone. Thakns to Bob Blanchard who helped block the wind so that I could make a sharp image at a very slow shutter speed. We headed back to Sanibel for an afternoon session at the fishing pier. We had great opps with the cooperative Snowy Egrets (eating live shrimp and greenbacks out of my bucket) and a Royal Tern hovering above us (with monofilament fishing line and a fishhook hanging from). But the big attraction was a nearby Osprey nest. The wind and the light were perfect and the folks who stuck with that situation got some great images of both perched and flying birds. Canon 100-400mm IS L lens with the EOS 1D-MIII (handheld at 320mm). ISO 400. Evaluative metering +1 stop: 1/640 sec. at f/5.6. We spent more than $20 for the 3 dozen shrimp that we put in our bucket. The snowies made short work of them gobbling them up like potato chips... Yes, this one should have been a vertical! Alfred and Fabs took a small group back to Venice on the last day, while I took most of the group back to Little Estero Lagoon. Venice was much better than on our first visit while Estero was not quite as good as it had been on Day 3. Both groups returned to our base, the LaQuinta Inn on South Cleveland in Fort Myers, and Alfred (Lightroom) and Fabs (Photoshop plug-ins) gave two great programs. 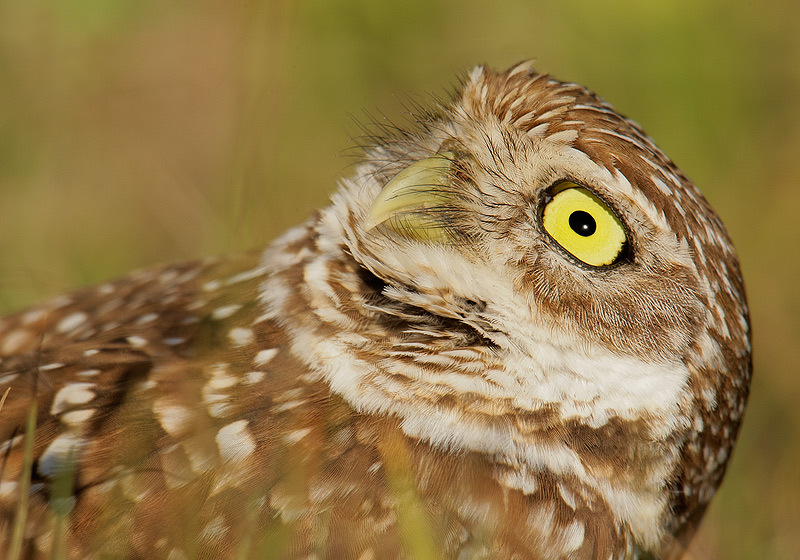 At 5pm we headed back to Cape Coral for another dose of Burrowing Owls. The birds were even more accepting of us than on our first visit. As the sun sank slowly in the west, we said our goodbyes and headed for dinner. Canon 70-200mm f/4L IS lens with the 1.4X II TC (handheld at 280mm) and the EOS-1D MIII. ISO 640. Evaluative metering +1 2/3 stops: 1/640 sec. at f/5.6. 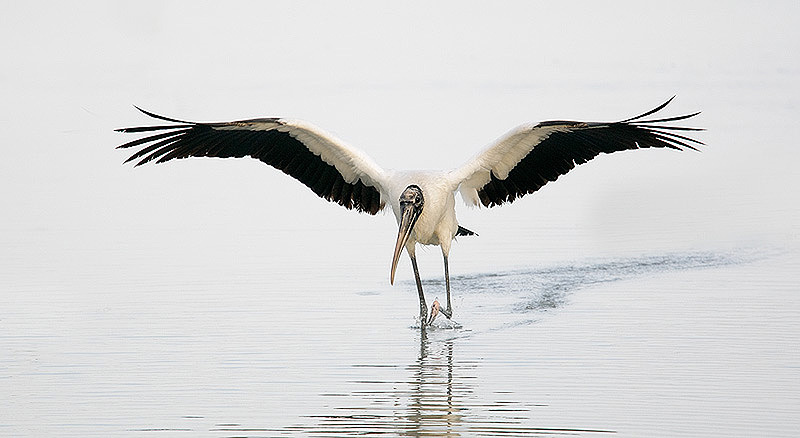 We were all surprised when this Wood Stork flew in and landed right in front of us. Note that with the dreary conditions I had to add lots of light. Canon 400mm f/4L DO lens (handheld) with EOS-1D MIII. ISO 800. Evaluative metering +1 stop: 1/4 sec. at f/32 on the Mongoose M2.3. 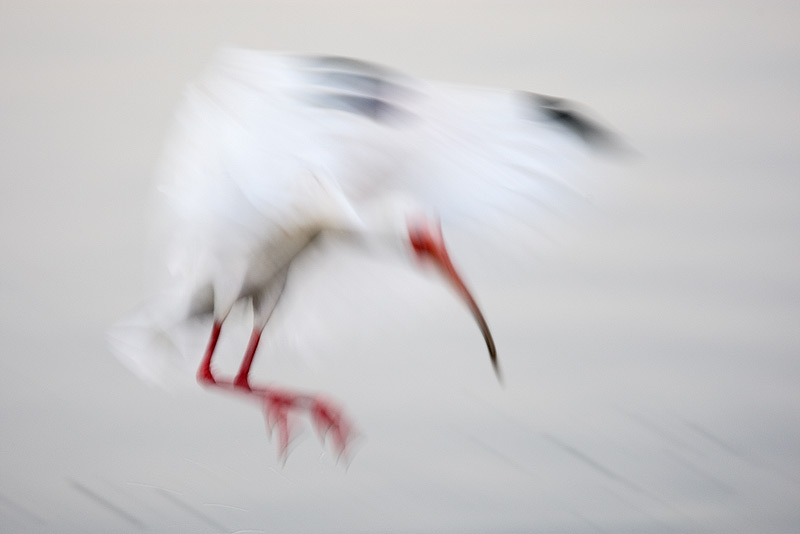 On our first dreary morning at Ding I was explaining in detail how to create pleasing blurs when this White Ibis flew in and I nailed it. <smile> I have been loving my 400 DO. . The SW FLA IPT will return to its usual mid-FEB slot in 2009. As I cut back on both the number and IPTs and the size of the groups, this will be one of the few opportunities to learn from me in the field in person. I am not sure of the co-leaders but be assured that I will be surrounded by a flock of talented folks. If you would like to join us, please call, mail, or Paypal send a $200 deposit at your earliest convenience. Canon 70-200mm f/4L IS lens (handheld at 75mmwith the EOS-1D MIII. ISO 400. Evaluative metering +1 stop: 1/500 sec. at f/9. When handholding to create a bird-scape, I almost always use One-Shot AF, focus on the closest bird, and then recompose. Here I focused on the nearest White Ibis on the right side of the frame. As I found out recently, having to cancel a trip because of health concerns (or unexpected personal or business problems) can be quite costly. For years we have been searching for a great company that provides a vast array of travel related insurance programs. More than a year ago we found that company in—of all places—the booth next to us at NANPA. After a year of research we can now whole-heartedly recommend TIS. If you have a big trip coming up, be sure to visit their easy-to-navigate web site here: http://www.travelinsure.com/what/selecthigh.htm?32940. For years folks have been asking us, “Can you recommend a great company that offers trip cancellation insurance?” We have finally come up with the answer: Travel Insurance Services. Here's the great news. The precision-engineered Giotto's MH 1302-655 Professional Socket and Ballhead weighs just 11.3 ounces yet is rated as powerful enough to hold 17.6 pounds of gear. It is downright tiny and downright strong. And best of all, the panning knob locks tightly for easy on and off, the tension adjustment is fine and easily set, and the main locking knob locks the head down completely. I have been dreaming of finding a head like this for years for a variety of uses. The MH 1302-655 comes with a square plate that we do not recommend for use. It is designed to work with the safety stop that can be see on the right side of the clamp above. You will need 2.5 mm sized Allen wrench (hex key) to remove the stop. The bad news is that the wrench does not come with the head; the good news is that you probably have one either in an Allen wrench kit or as the smaller of the two Allen wrenches that come with Wimberley plates equipped with stop studs. The 2.5mm Allen wrench is the one that fits the stop studs. We do recommend the use of the generic Wimberley P-5 Camera Body plate ($57 including shipping and handling from BAA). Regular readers know that I have never liked the Wimberley Sidekick atop a ballhead for either intermediate or long telephoto lens. (Do note that we sell several dozen Sidekicks each year and will be glad to send you one at any time.) Recently on the SW FLA Spring IPT Giulio Zanni arrived with a Mongoose atop a Really RIght Stuff Ballhead. After he set up his Canon 400 DO/pro body rig he wanted to know why the Sidekick was always slipping making lens handling difficult to impossible... "That’s what is," I said. My other huge concern with the Sidekick/ballhead set-up is the weight. Giulio borrowed the lightweight Mongoose M3.5 and purchased one immediately. Since the introdcution of the two Mongoose Action heads, first the M2.3 for the intermediate telephotos and then the M3.5 for the Canon 400mm f/4 DO, the Canon and Nikon 500mm f/4 lenses, and the Nikon 200-400, I have counseled many folks away from the Sidekick. "But I do lots of scenic photography; what am I gonna do?" I always followed that up with this: "When was the last time that you were using a telephoto lens, removed your Sidekick from the ballhead, and mounted your camera and short lens on the ballhead?" If they say that they do it regularly, we sell them a Sidekick. Most folks, however, admit that they had never done it or that they had done it once several years ago. We then strongly recommend that they opt for one of the Mongoose heads. 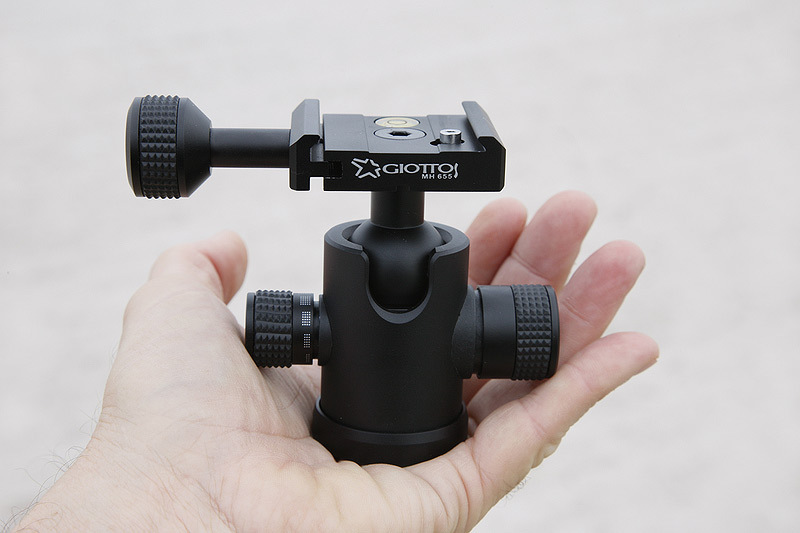 The tiny Giotto's MH 1302-655 Professional Socket and Ballhead will solve everyone's problems. Your MH 1302-655 can be stowed easily in a photo backpack, your vest or even in a pants pocket. If you are using a telephoto lens and want to make some scenic images with a short lens at slow shutter speeds, simply twist off your Wimberley or Mongoose head, spin on the tiny Giotto's ballhead, and get to work. We do recommend the use of the Wimberley P-5 generic camera body plate on your camera. Below you will find some illustrated tips for using your new ballhead for scenic photography with lenses that do not come with tripod collars. Do know that the head is strong enough to be use with small intermediate telephoto lenses and with all macro lens, even when they are equipped with professional camera bodies. Folks looking to save weight both in the field and when packing for air travel will find this mighty mite irresistible. This item is currently in short supply. We have five on hand and a large back-order as I am positive that this item will meet the needs of many nature photographers once the word gets out. As usual, we are selling this item for less than B & H. You can order your Giotto's MH 1302-655 Professional Socket and Ballhead. For horizontal scenics, place your camera body plate in the center of the clamp. With this set-up, the panning knob is in the center, the main locking knob is on the left, and the tension adjustment screw is on the right. A bubble level is pretty much mandatory for landscape photography. 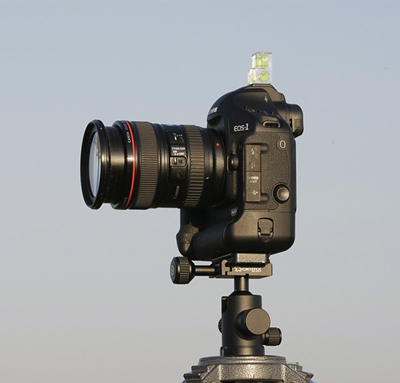 Here is the Canon 24-105mm IS L lens and an EOS 1D-MIII mounted on the tiny Giotto's ballhead. 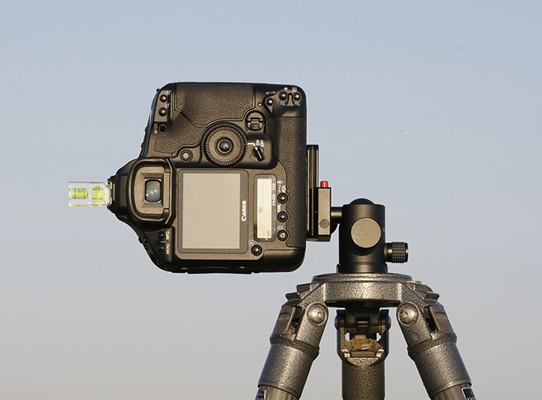 When working in vertical format it is imperative that the plate be shifted to the right in the clamp so that when the camera is turned on end, the plate does not hit against the tripod platform. A quick look at the next iamge will clarify this. 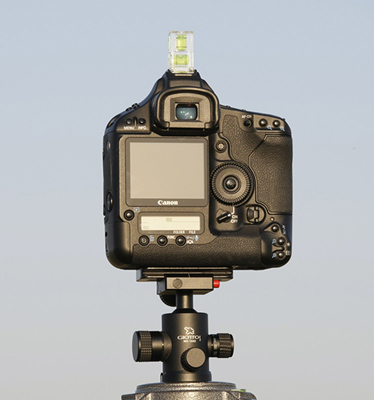 One of the great advantages of having the tiny Giotto's ballhead available for landscape photography is that eliminates the need for an expensive and heavy L bracket as setting up for verticals is a snap. (The stem of the ball slides into the cut on the side of the housing.) Note that working in vertical format the tension adjustment screw needs to be on your left so that that cut in the housing is on your right. You can find my article “Exposure Simplified” both in ABP II and excerpted in the current BPN e-Zine here: http://www.birdphotographers.net/ezine/mar08_01.aspx . Things, however, have changed substantially since that was written. Before the release of the Nikon D-3 and D-300, the meters in most digitals cameras were very similar, but those two cameras are considerably different from the rest of the crowd. Not necessarily better, but surely different. In short, these two Nikon bodies need much less plus compensation when the light is soft (predawn, just after dawn, cloudy, foggy, etc. ), but need more underexposure when the sun is at full strength, especially with bright or white subjects. The fact is that today, with the many great digital cameras available, the meters can be very different. Sometimes, even individual cameras that are the same model (for example, two Canon EOS 1-D MIII camera bodies) will meter the exact scene differently yet each will yield a good histogram and a god exposure. Your job as a digital photographer is to learn not only the basics of exposure but the characteristics of your camera's meter. As always, your goal is to have some data in the right-most histogram box without having any flashing (pegged or over-exposed) highlights. It is no longer possible for me to give accurate generic advice on exposure compensations for a given situation because the cameras and the meters are so different, and in the same vein you should not be drawing any major conclusions from the exposure compensations as stated in the Bulletin image captions. 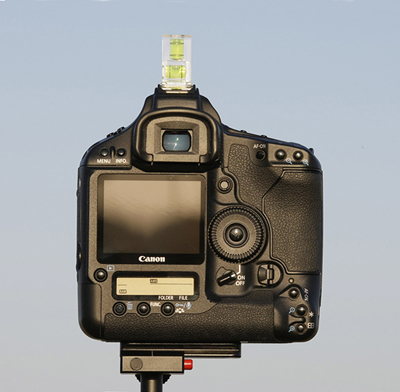 The photographer needs first to learn exposure theory and then learn how to come up with a perfect exposure and a perfect histogram with the camera that they have in their hands at a given moment. Canon 500mm f/4L IS lens (on Mongoose with 4th GD low foot) with the EOS-1D MIII. ISO 1250. Evaluative metering + 1 1/3 stops: 1/30 sec. at f4 in manual mode. Thanks to the generosity of Canon USA I will be the keynote speaker doing two programs at the PFLI (Photographic Federation of Long Island) Spring PHOTOFEST event on April 6. You can learn the details by clicking here: http://pflicompetition.homestead.com/, scrolling down, and clicking on the Click for details link. The cost is $30 per person. I hope to see many Bulletin subscribers and many old friends there. Canon 500mm f/4L IS lens (with the Mongoose low foot), the 1.4X II TC, and the EOS-1D MIII on the Mongoose M3.5. ISO 400. Evaluative metering +1/3 stop: 1/1000 sec. at f/8. The raised foot and the perfect head angle add to the success of this image. The second bird is hoping that the crab gets away. Check out Carolyn Darmo's wonderful Chickadee High Key here: http://www.birdphotographers.net/for...ead.php?t=7610. It should be in the dictionary next to the word "painterly." In Macro John Cooper's backlit SIlver Zenica Pair is simply superb. Johh, from New South Wales, Austrailia, is one of our many talented foreign photographer/artists. BirdPhotographers.Net/It Ain't Just Birds (www.BirdPhotographers.Net) has quickly become the number one educational and critiquing web site on the planet and continues to improve. A quick visit to any of the galleries will reveal that our philosophy of "honest critiques done gently" and leading by example are succeeding quite well. (If you are a first time visitor, you will be prompted to register. Registration is free.) 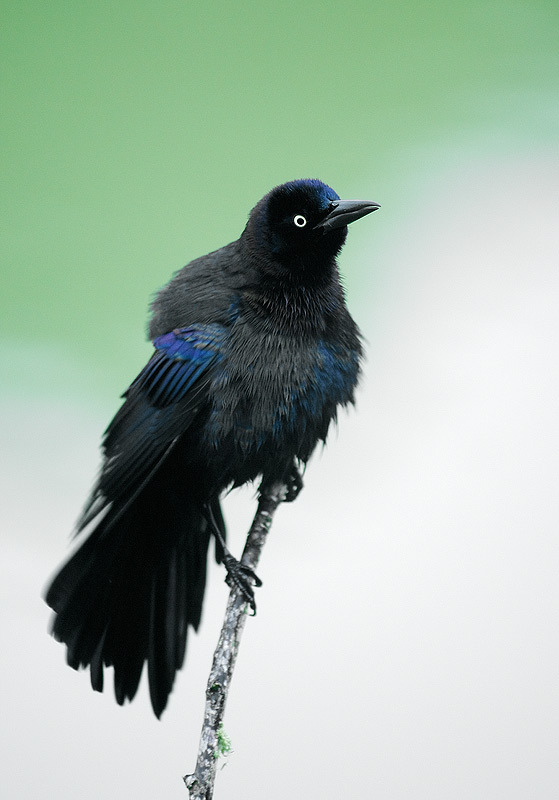 Folks who will be using our image hosting services or otherwise wish to support our efforts are invited to become members by clicking here: http://www.birdphotographers.net/forums/membership.aspx. Though membership is free up until April 1, 2009, more than 425 folks have already shown their support for BPN by joining as members ($20 annually). Canon 500mm f/4L IS lens (with the Mongoose low foot), the 1.4X II TC, a 25mm Extension Tube, and the EOS-1D MIII on the Mongoose M3.5. ISO 400. Evaluative metering +1 stop off of the water: 1/125 sec. at f/22 in Manual mode. 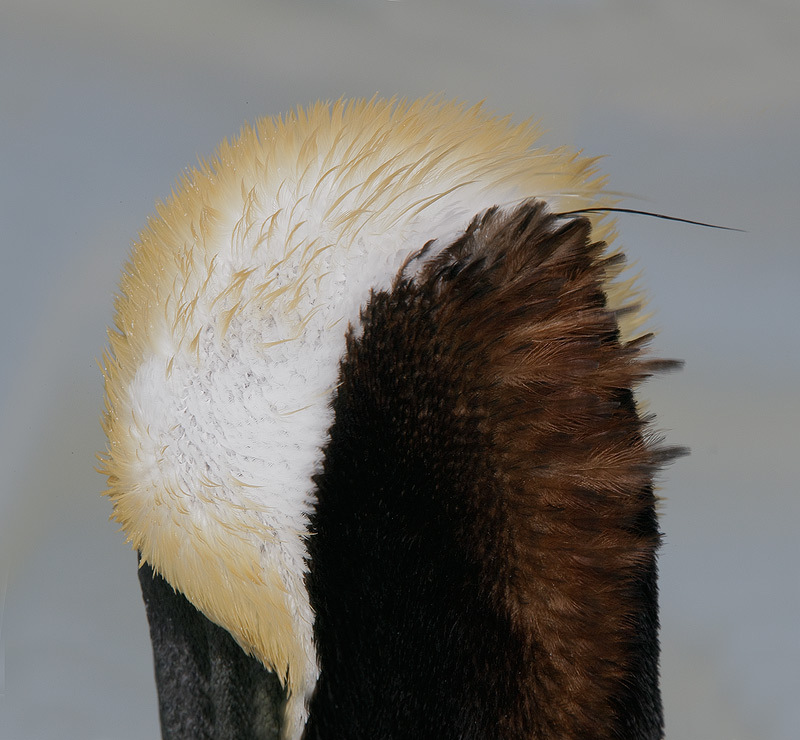 This is a composite of two images, one of the right side of the head, the other of the left side of the head. To stitch the images I converted them both and then selected them in File/Automate/Photomerge. Photomerge in CS3 is absolutely remarkable.